When it comes to bashing, having the fastest truck, the one that jumps the highest, hits the hardest and runs through anything is sure to make you the top dog in the neighborhood. The Duratrax Evader, with its track-worthy handling to its performance-minded configurations, is one of the oldest and most respected names in bashing. This truck has made a legend of itself when it comes to bang for your buck and the Evader Brushless is its newest incarnation. With a new 3930Kv brushless motor, 2.4GHz radio and waterproof radio gear, the Evader Brushless may just be as good as it gets. The Evader might look like your everyday truck, but when Duratrax packed it full of updates, go-fast goodies and coupled all that with the company’s famous Stress-Tech parts warranty, it may very well be a wolf in sheep’s clothing. In my time in this hobby, I’ve owned a few Evaders so when it came time to test the new brushless version, I couldn’t wait for my trusty Duratrax Onyx charger to top off the battery. What you may not realize from first looks is that like its predecessors, the Evader Brushless handles like a real pro. A well-balanced chassis and tuned suspension lend to its track-like handling right out of the box. The aggressive pattern on the Duratrax Terrain S/T tires gives a solid amount of grip in the loose stuff while keeping a lower profile suitable for blasting up and down the road. Did I mention blasting up the road? The biggest feature of the Evader Brushless is obviously its power system. On first pull, the Evader easily popped a wheelie before setting down and taking off down the street. Cruising at about half-throttle still yields impressive speeds that are further rewarded when you grab the rest of the gas and pull mid-run wheelies. Saying that the Evader is faster than you’d expect would be putting it mildly and the 3930Kv motor proved itself to have a surprising amount of speed and power. Taking the Evader off-road is equally as exciting as you can power your way through anything you can get over or around. While the softly damped shocks do well soaking up bumps, the wheelie bar, which worked well on the asphalt, now proved to be a challenge as it easily caught on anything raised like twigs or leaves and even scraped on the dirt as the Evader headed up the face of larger jumps. I pulled the truck over and removed the bar before setting back off and the situation was much better. The Evader jumped very nicely for an entry-level RTR and had a lofty and level characteristic similar to that of much larger trucks. Landings are equally as soft as the Evader touched down and was ready for more. The Evader is surely no new kid on the block. Over the years, Duratrax has released new versions of the same truck rather than start all over again and for good reason. The Evader Brushless shares the same poise and handling as its previous versions but now features the pavement- pounding speed of a brushless system. A 2.4GHz radio design by Futaba keeps things under control and adds a wow factor to a truck that has enough power and poise to keep you smiling from ear to ear. 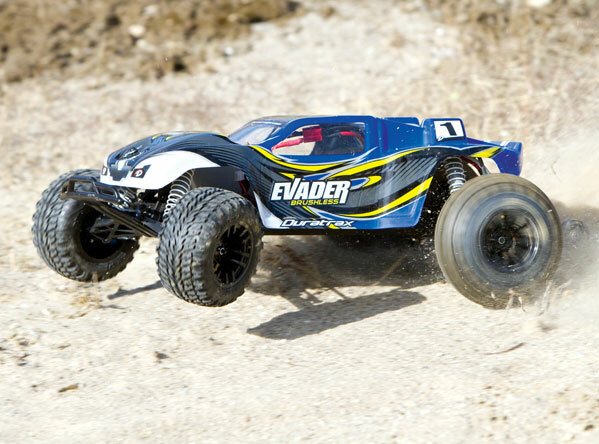 If you’re looking for a flexible truck that can be nearly anything you want it to be, from a fire-breathing hot rod to a full-tilt track star for around 250 bucks, the Evader Brushless has what it takes to rule the neighborhood. i’ve owned the evader brushless since it came out and i’m pleased for the most part….. when its not broken…. once you use it a little bit the worms start to come out, first, double check your screws and set screws. my pinion set screw came loose on the 2nd run, first minor cartwheel roll the left rear hub snapped, third run the steering servo saver came loose and i lost steering, after about 4 packs the differential gave out, found out that it was double gasketed on one side from the factory causing excess clearance on the one side which stripped the gears. got a new gear set installed and after the first run the new gears broke, garbage! its a good truck but needs some stronger parts, seems like everytime i run it something breaks, if i would have waited and gathered all the parts up i’d be sending half the truck back for their warranty replacement….